“We’re on a pilgrimage to see a moose. Praise Marty Moose!” Those were wise, unearthing words from America’s family man Clark W. Griswold (Chevy Chase) as he trekked his family from Chicago to California inside the Griswold family truckster back in 1983. Clark, along with his wife Ellen (Beverly D’Angelo), and their two kids Rusty (Anthony Michael Hall) and Audrey (Dana Barron) encountered a variety of hilarious obstacles and problems along their difficult road trip, but they stuck together as a family and proved that any American family can make it across country without killing one another…mostly. The film spawned a number of sequels over the years, which saw the Griswold family celebrate Christmas, fly to Europe, and even gamble in Vegas. It’s been about 18 years since we saw the Griswold clan go on vacation or celebrate a holiday, and Hollywood thought it was time to reboot the franchise. Writing team John Francis Daley (Sam Weir from ‘Freaks and Geeks‘) and Jonathan Goldstein struck gold with their scripts for the ‘Horrible Bosses’ films, and were now given the chance to direct as well the new installment of the ‘Vacation‘ franchise. 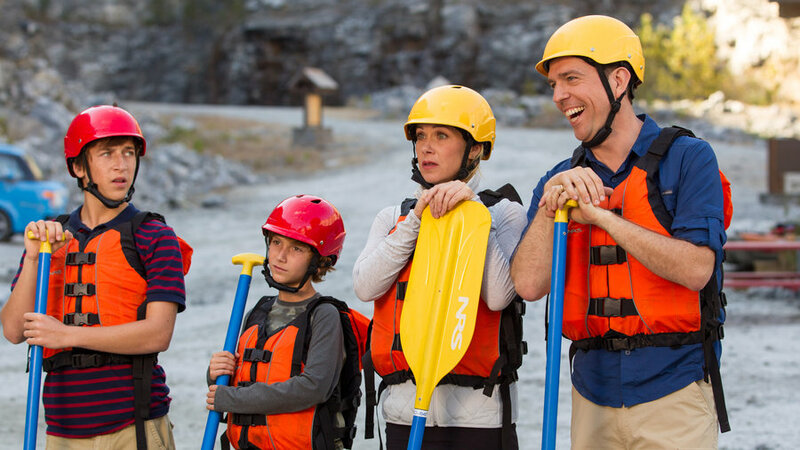 Instead of completely rebooting the franchise from scratch, Daley and Goldstein made a late sequel, which follows Clark’s son Rusty (Ed Helms), who has a family of his own now including his wife Debbie (Christina Applegate) and their two young sons James and Kevin. To surprise his family by not going to the same old boring cabin in the woods every year, he decides to take his family to Wally World, the place where he first took that infamous road trip, and of course they’re driving there cross country. Well of course, you can imagine, things don’t go according to plan. Daley and Goldstein did a great job with the screenplay, by keeping things fresh and original, while paying homage to the original film. There are problems with the vehicle that travels across country, interesting night time talks at a motel, and side trips to see famous landmarks, but that’s about as similar it gets to the original. Every thing else stands on its own and is down right laugh out loud funny. For instance, when the Griswold family meet up with sister Audrey (Leslie Mann) in Plano, TX and her hunk of a tv weatherman husband Stone Crandall (Chris ‘Thor’ Hemsworth), where he can’t stop talking about faucets. Through all of the laughs, one things remains constant, and that is what Chevy Chase showed us in the original films. Clark taught us that no matter what issue arises, he will do anything it takes to make his family happy and have a good time on vacation, so they can better bond and love each other. Ed Helms conveys this perfectly, and it’s as heartwarming as it is funny. Packed with some excellent cameos, past and present throughout, this new ‘Vacation‘ film has already earned the stamps on its passport and is ready for its next vacation. (I’m sorry about the pun, I’ll show myself out. Enjoy the Red Band Trailer for the new ‘Vacation’ Movie! Fans of Family Dysfunction – The Griswolds Are Returning To The Big Screen!!! Looks Like Christina Applegate will Star Opposite Ed Helms in ‘Vacation’!!! This entry was posted on Monday, July 27th, 2015 at 6:57 pm	and is filed under Film, News. You can follow any responses to this entry through the RSS 2.0 feed. You can skip to the end and leave a response. Pinging is currently not allowed. « Bring ‘The Avengers: Age of Ultron’ Home on Blu-ray In October!! !